MTV: You go everywhere with your music. What are some of the zones that you been going into while making your new album? 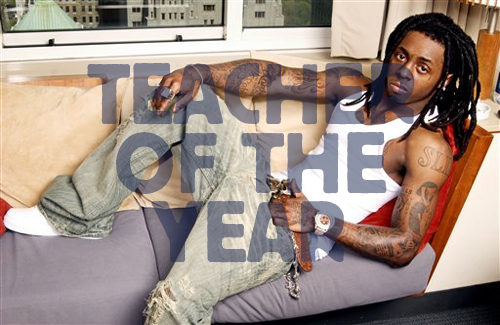 Lil Wayne: I go wherever my creativity takes me. I ain’t gotta be in no zone, ’cause if I was in a zone, I ain’t never fall out. I ain’t never out of the zone, so I don’t know what the zone look like or smell like. I’m always creative. I think your ability to maintain a creative state hinges on this question: what do you do with an idea once it strikes. Your answer, I think, determines the quantity and quality of future ideas. Here’s my advice, for whatever it’s worth: don’t use your brain to store ideas. Using your brain to store a good idea for that post or lesson is like using a fancy schmancy laser cutter to chop wood when an ax suffices fine. Your brain is good for creating ideas. Paper is great for storing ideas. If I hadn’t wimped out of that Secret of My Success meme awhile back, I would’ve submitted the fact that I’m always packing paper and pen. When I can’t use paper, I use Jott. I drove an hour last week and left myself seventeen Jotts all relating to the same opener question (the one about Hawaii) all evenly dispersed over the drive, each of which flew from my cell to my gmail box in time for my arrival. The thing is: Jotts beget more Jotts. I use the drafts feature of WordPress to store post ideas. Writing down a new idea plus a few supporting notes as they strike costs me nothing. More ideas come. Making that slideshow, I stored the shot list in GoogleDocs, refreshing it constantly. My brain fully accustomed to the filling/emptying cycle, more shot ideas came. This is, of course, a founding principle of my trademarked pedagogy, Method Teaching™, which has been optioned for immediate textbook adoption by McDougal-Littel: stay receptive to interesting things and you can’t help but become interesting yourself. Method Teaching and Method Rapping both derive from the same strategies.And any similarity to David Allen’s Getting Things Done system is, I swear, purely coincidental. True, sometimes it gets out of control. But I think Young Wheezy would agree with me that a surplus of creativity is always preferable to its absence. This is a great post, and the reason why I haven’t had the need to write a lesson plan all year. Much of what I do is improv, crowd response, and experience. People might think I’m crazy when I tell them I haven’t written a lesson plan in ages, but it’s the truth. I might write down some notes, but most of it is a freestyle. So maybe I can be on top of the R.O.C. Jay-Z’s in the Teacher Hall of Fame imo. Yeah, I reckon that He Who Doesn’t Write Down His Lyrics would approve of your style. I have other long-term organization tools (lovin’ Remember the Milk and Google Calendar), but since I started doing this, I’ve had far fewer occasions to kick myself for forgetting ideas that have hit at the least likely times. Worst feeling in the world by far (for me) in your last sentence. Young Wheezy: Isabel Sanford’s hip-hop stage name? Show and Tell: Day 16	This is all your fault.